I believe that everyone is an athlete. I work to increase your athletic ability by utilizing constantly varied functional movements like pushing, pulling, squatting, lifting and running, executed at high intensity. I will help you reach your goals by increasing endurance, strength, flexibility, power, speed, coordination and agility. Whether starting from step one or improving an already elite athlete our programming can help you achieve success. 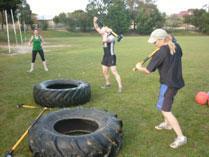 Group classes are a great way to maximise your training. They put the fun back into exercising. When you need a little boost with your motivation or just want to push yourself a little harder, then Mix-It-Up Fitness group classes will leave you feeling invigorated and ready to go!